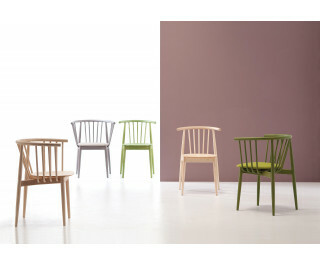 Tivoli collection is a new interpretation of the mid-20th century Scandinavian design. It takes advantage of the new innovative technology to produce and bending of wooden spokes. The structure is made of solid ash wood, mat stained in various finishes and colours. Result is quiet, yet character collection which fit both public and private interiors. Chair and armchair are stackable.